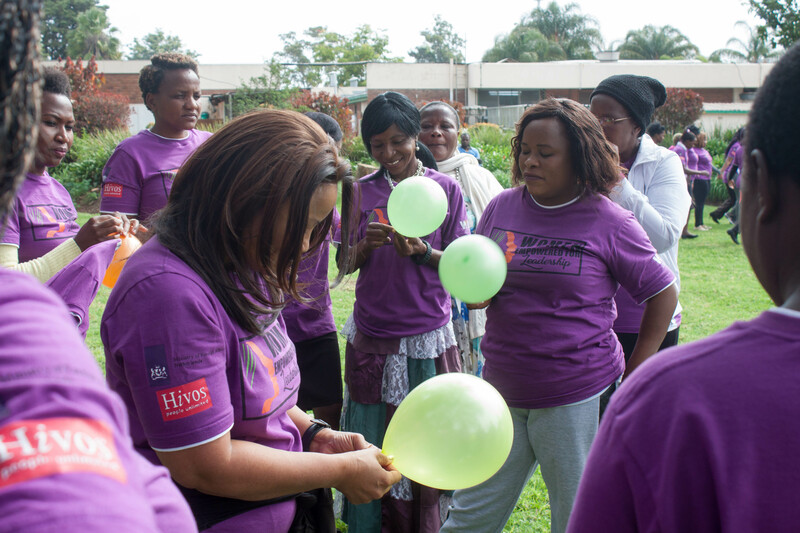 The Women’s Institute for Leadership Development (WILD) organized a two day leadership retreat in Bulawayo, Zimbabwe as part of Hivos’ Women Empowered for Leadership (WE4L) programme. The meeting brought together female leaders in fulfillment of earlier commitments to contribute to a mentoring programme for aspiring women leaders in business and politics. At the retreat, women leaders shared their experiences in leadership particulalrly the challenges they overcame to become influential leaders. The stories of most women leaders were punctuated with the challenges they faced in their leadership journey. Most of the challenges focused on societal barriers to women leadership in a larlgely patriarchal society. Most inspiring were the coping mechanisms and strategies that the leaders used to overcome the societal barriers and gender stereotypes and finally owning their right to lead. The Women Empowered for Leadership (WE4L) programme is a flagship program for Hivos in Southern Africa and the Middle East. In Southern Africa, the programme is in Malawi, Zambia and Zimbabwe while in the Middle East the programme is in Lebanon and Jordan. In Southern Africa, women participation is hindered by social practices and patriarchal value systems resulting in taboos that the WE4L seeks to debunk. Although there are tools and instruments in place to increase effective participation by women, implementation remains a constant battle, a battle that Hivos Southern Africa and its partners continue to fight. Hivos Southern Africa has formed strategic partnerships in the implementation of the WE4L program allowing for women in and aspiring to be in public administration, civic and political spaces to come together and support each other to achieve their leadership goals. The programme, implemented with local partners supports women participation in social and political spheres through providing capacity and interactive platforms. As part of the capacity building, various approaches are used including training, coaching and enhancing effective communication by aspiring women leaders. The leadership retreat that was organized by WILD identified influential women leaders in politics and business. The women attended the leadership retreat to take up mentorship roles for women who aspire to lead and participate meaningfully in their communities. The retreat themed: “Today is the beginning of the rest of your life,” saw participants interfacing with their role models and learning from the leadership journeys of women that have had to struggle to be recognised as leaders within their communities. Mentors included women leaders in Zimbabwe politics representing ZANU-PF, PDP, NPP and ZAPU. Legislator Priscilla Misihairambwi Mushonga urge aspiring women leaders to be strong if they are to survive the rough terrains and challenges that come with leadership. “I developed a thick skin being in politics, learnt how to fight my battles better and not let narrow-minded comments deter my aspirations and work,” said Hon Priscilla Misihairambwi Mushonga. Another legislator, Jasmine Toffa, said that there was power in making a decision and acting upon it. “I was always calling out others on how they were ruining the country, until one day I asked myself what I was doing to stop this. I woke up the next morning and said to myself, I am going play my role and participate. I never turned back from that day,” said Toffa. The leadership retreat was a platform not only to share leadership opportunities, experiences and tips, but an opportunity for women aspiring to be leaders to meet the women who inspire them, understand how they made it and open the channels of communication between ordinary women in communities and those in leadership. Other platforms will be organized by WILD in the future to monitor the effectiveness of the mentorship project and identify how many women are taking the next step into leadership roles together with other monitoring methods.